Rasam is one of the most vital dish in a South Indian menu. It is taken with cooked rice and any dry curry (of course pappads) as a side dish. Some even drink it as a soup.Rasam has a very simple recipe but as one wears the apron to make it, trust me its very difficult to get the same taste every time. The secret to a perfect rasam lies on the way tamarind juice gets cooked. Over-cooked rasam will taste sour. There are “n” number of rasam varieties and I personally have tasted more than 10 at home. I can proudly call my mother as a “Rasam Expert”. The rasam she makes, has the perfect taste and every one in my family will agree to this.The magic behind her spicy rasam is her own “rasam podi”. I still remember this scene in our kitchen. It was the summer of 1997, I was sitting on the kitchen slab and was watching my mom make her “rasam podi”. I would enter the kitchen either to carry my huge snack box to the living room or to fetch water, other than that I used to feel that kitchen wasnt my domain. This was during my summer vacation and I was totally engrossed in hearing my mom’s childhood tales….her cooking experiences…the stories she heard from her grandmom… (that made me enter the kitchen he he). My mom lifted me and made me sit on the kitchen slab.As, I was passing her spices-dabbha (box) from the rack above my head, she kept telling me the significance of each spice she uses to make this podi and how medically important are they in our day-to-day living. I wasn’t really concentrating on her talk and was busy munching my fav “Kaju fry”. Years passed, n it was in 2007 when I was watching the movie “Mistress of Spices”, I was reminded of this incident. Immediately, I called up my mom and we had a chat about the movie and also about this rasam-podi-making story of 1997. She was surprised that I remembered it. Ummmm!! !… small incidents in life are deeply etched in our hearts forever and one such incident to me was this. Here are a few quick health benefits about the ingredients used in “rasam podi”. 1.Cumin seeds has digestive, stimulant and cooling properties. It is a excellent remedy for stomach disorders, flatulence, colic and diarrhea. 2.Pepper balls improve digestion and promotes intestinal health. 3.Toor dhal is rich in protein. 4.Coriander seeds are rich in vitamins and minerals. It provides calcium, phosphorus, iron and some other vitamins such as vitamin B and vitamin C to the body. It is also used as a carminative.Coriander helps to prevent digestive disorders such as indigestion, flatulence and gas. 5.Curry leaves are the rich source of Vitamin A. It controls the cholesterol level in the body and also prevents graying of the hair. Pineapple rasam is prepared with wonderful aromas of cumin, coriander,tamarind and ofcourse the pineapple.It will taste sweet, sour, tangy and spicy!Served with a spicy potato curry,this meal presents itself with a lovely taste. This dish is a delightful treat to your taste buds. It leaves your tongue with a kick at the end of every mouth. The recipe for rasam podi can be found here. Pressure cook the toor dhal with more than a cup of water and finely mash them. It should be more watery in consistency.Keep aside. Prepare the tamarind juice and keep them aside. Heat oil in a kadai on a medium flame. Add the mustard seeds and asafoetida. Let them splutter. Now add the tomatoes and cook them till the raw smell disappears, then add the turmeric powder, chilli powder and coriander powder. Saute for about 5 min. Pour in the tamarind juice and cook on medium flame for 8-10min. Check for the taste, if the tamarind is raw let it cook for next 3-5min. Pour in the toor dhal and bring the whole mixture to boil. Finally add the pineapple paste, cubed ones and sprinkle the sugar.Add salt to taste.Garnish with finely chopped coriander. 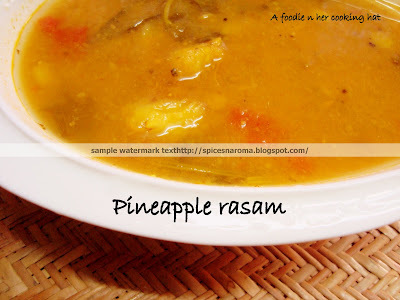 Serve this exotic pineapple rasam with potatoes fried in onion-garlic mix/ any spicy curry. You can also serve it as a soup with fried pepper pappads. 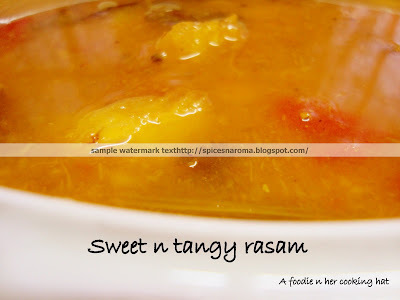 recently saw this at someone’s blog..this rasam is really yumm..am going to try this..nice picture..
looks yummy Viji. i made it day before yday..
Yummy rasam! looks so good. 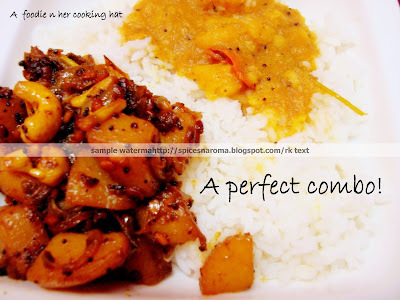 I saw this at Mahima’s blog too and was tempted.. Got to make it soon.. Looks so delicious Vij. Yummy rasam dear. Loved the Malaum ninaivugal (1997 story) very much. Pineapple rasam! Are u kididng?! wow!! this is awesome! i love teh spicy potatoes too… u r making me hungry girl! I don’t know why I have been putting off trying to make a rasam for so long and I know that it is something that I would enjoy. I’ll definitely give this a try soon. I like the idea of the pineapple version you have here. However, I think I’ll try the general one first before moving on to other flavours. I love pineapple, so this must be great. Yummy! Just thinking of the sweetness of the pineapple with the spiciness of the rasam set my mouth watering. Delicious post, Vij! Thanks Vij! taking baby steps…glad u liked it n tell me once u try, how it tasted. have to try this, have some pineapple at home. Looks so yummy. Pineapple being my fav fruit, I have to try this for sure. Never had pineapple rasam though I’m sure it must taste fantastic. Pineapple pachadi is lovely so this also must.